In a talk organized by the Spanish Agency for International Cooperation and civil society, Costa Rica started discussions on PrEP. A week ago, Spain’s Cultural Center and Igual Cuídate organized a talk during which the documentary Sin miedo al VIH (No fear of HIV) was screened and participants discussed the use of PrEP in Costa Rica. These activities are held in response to the needs for actions to provide training on human rights, as well as information and strategies to empower people with HIV and key populations. Although the country makes efforts to decrease the number of new HIV infections, in recent years said rate has risen from 0.4 to 0.6 per 1,000 inhabitants. In this context and given the existence of new prevention technology, such as PrEP, one would expect Costa Rica’s Ministry of Health to include the combination of tenofovir and emtricitabine in its list of medicines. However, that is not the case, and more coordination among civil society organizations is needed to address this issue, expand the knowledge the population has on the subject and push for its inclusion. Experts who have been conducting research on the inclusion of this technology in Costa Rica participated in the talk. One of them pointed out a weakness when trying to operationalize demands for its inclusion in this Central American country. “Guidelines of the FDA and some European countries consider PrEP as a means which help prevent the disease. In Costa Rica, the Ministry of Health has not done that because the laboratory did not have commercial interest in providing the studies supporting its inclusion”, says Roger Cartin, one of the speakers. That was a first step to approach PrEP in the country through the public health system. According to the speakers, the combination of medicines is being sold at authorized pharmacies of the private sector, and the cost is around 250 dollars per flask, which not all vulnerable populations can afford. During the event, young participants expressed their interest in getting to know more about the subject, empowering themselves with their rights and accessing that prevention method. Many asked specifically about the use of PrEP, requirements for taking the medicine and its mechanisms of action, which is indicative of the importance of continuing using dissemination and information strategies. 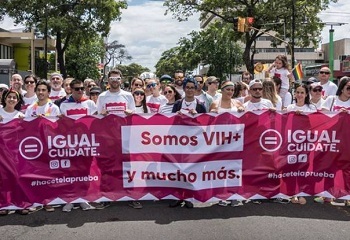 Furthermore, the importance of continuing with social interventions to strengthen the rights of people of various sexual orientations to achieve elimination of stigma and discrimination in Costa Rica was also revealed. That goal can be attained by talking about the subject and new prevention methods which will help overcome HIV-related biases. The World Health Organization recommends countries to provide all measures of the combination prevention strategy. That includes providing condoms, lubricants and HIV tests in areas frequently visited by key and vulnerable populations, as well as expanding access to pre-exposure antiretroviral prophylaxis. Anyhow, nothing would be possible without an empowered civil society which knows its rights and demands its government to deploy all evidence-based prevention strategies. All articles can be shared and published provided all data regarding the source are cited.